About Naples and Marco Island, Florida - BeachDirectory.Com - The entire Florida Gulf Coast...in detail! Naples was the fastest growing metropolitan area in the entire United States for the period 1980 through 1989. The population tripled during this time period. It hasn't slowed down much in the 1990's - when you visit Naples, you will notice that most buildings are brand new. However, there is the picturesque Olde Naples in the Downtown area. Development has also brought re-development, and there are now only a handful of beach-front or near-beach hotels in Naples. They also tend to be at higher price points, such as the Edgewater (a Waldorf-Astoria property) and the DoubleTree. The Sea Shell Motel and Sea Court are two centrally located budget alternatives that price-conscious visitors seem to like. We also list and link all 30+ properties we are aware of in the Naples and Marco Island area. Picture on left: Naples Pier at Sunset. The Naples Chamber of Commerce website has additional visitor information for the Greater Naples area, including Arts & Culture, Events and much more. They also have a visitor center you can visit while you are in the area. If you need additional information, please call them at (941) 262-6141. For local news, see the Naples Daily News website. The City of Naples has a web site that may be of interest if you live in the area. The site offers everything from the City Council meeting schedule to water and sewage standard. Marco Island really is an island - it is connected to the mainland by the Jolley Bridge, part of State Road 951. 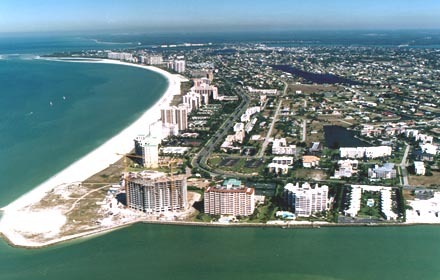 Marco Island has two "population centers" - Marco Island and Goodland. The picture below shows the main beach on Marco Island. Calusa Indians once lived on Marco Island, surviving on fishing and hunting. Some is known about Calusa Indians, but little is known about those who lived on Marco Island, since they disappeared at about the time of the arrival of the Spanish explorers. When Capt. Collier arrived in 1870, he found many Indian artifacts, one of the richest finds in Florida. Many sites were excavated by researchers from the Smithsonian Institution. Marco Island offers excellent fishing and shelling. The Naples / Marco Island area has over 40 (!) golf courses. Marco Island is a special place where you really can get away from it all. Local newspapers - the Marco Island Eagle, published every Wednesday, is a local newspaper read by residents and visitors alike. They also publish many of their articles online. Subscriptions to their printed paper can be made online, you can receive the newspaper even if you live outside of the area. Government: the City of Marco Island has a basic web site, but they do a very good job of keeping it up to date with City Council meeting minutes and biographies of elected officials. The tiny fishing community of Goodland with only 200 residents has it's very own website! While in the area, do take the time to visit the Everglades. The Florida Everglades Chamber of Commerce has a useful site to help you plan your activities. Don't miss the quaint village of Everglades City, as well as Ochopee Post Office, the smallest in America. Also, even if you hate outdoorsy things, head out on an airboat in the Everglades - it is a one-of-a-kind experience that cannot be found anywhere else in the world. See pictures of the Everglades below.